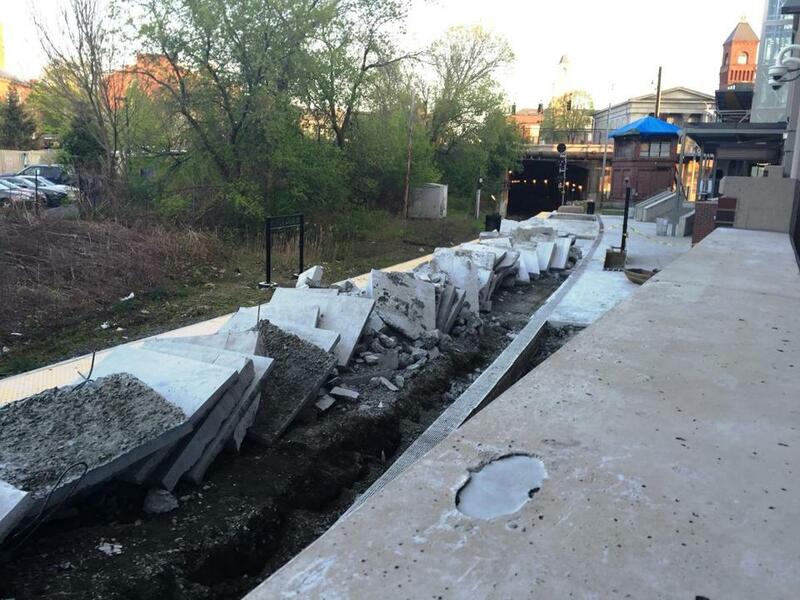 Portions of the train platform are being dug up and replaced at the Salem Commuter Rail Station. A year and a half after the opening of the new Salem commuter rail and bus station, the MBTA and its contractor are working to correct two lingering problems with the $44.5 million project. Earlier this month, workers began repairing portions of the concrete train platform to bring it into compliance with disability access requirements. The work, expected to take another five weeks, is being done by Consigli Construction, the firm that undertook the original project, according to MBTA spokesman Jason B. Johnson. The contractor also is addressing the wind-driven rain blowing into the station’s waiting room and the stairs leading to the train platform, according to Johnson, who estimated that work would be completed in the next few months. “We are committed to the action plan developed with the MBTA to immediately address the issues raised and expect to finish soon,” Christopher Loh, a Consigli spokesman, said by e-mail. The station, which opened in November 2014, includes a 715-space parking garage with space for Zip cars, electric cars, and bicycles; a bus platform; a pedestrian walkway from Bridge Street; and improved seating, lighting, and signage. Johnson said by e-mail that because of an oversight by the contractor, parts of the 880-foot train platform exceeded the 2 percent “cross slope” requirement set by the state’s Architectural Access Board. The limit, which is also enforced by the Americans with Disabilities Act, represents the slope across the width of the ramp. The repairs, which began May 9, are to correct the portions of the platform that exceed the 2 percent slope. One half of the platform is being repaired at a time, enabling passengers to use the other half. Johnson said the MBTA is not funding any of the cost of the corrective work. 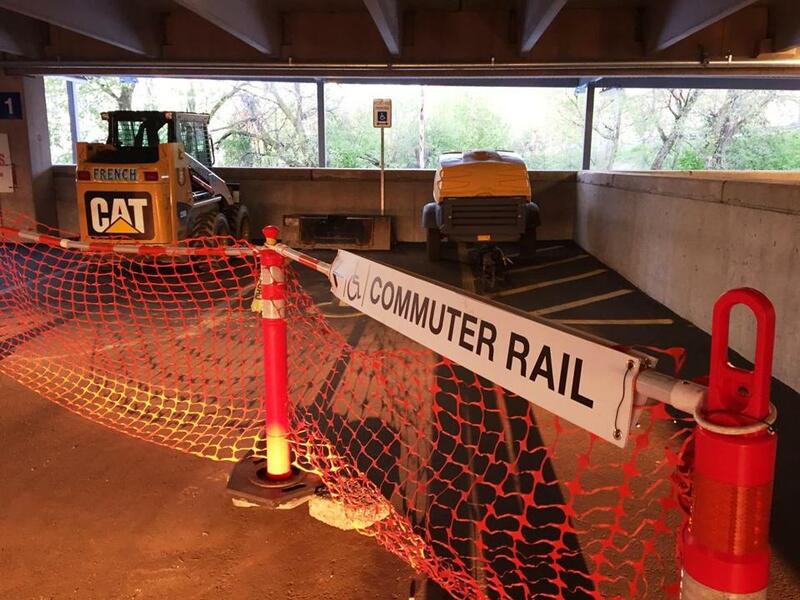 Approximately 30 spaces on the ground floor of the garage are temporarily unavailable for parking so the area can be used by passengers to bypass the platform area being repaired, said Johnson. The spaces should be returned to parking use within two weeks, he added. To address the rain blowing into the stairs and waiting room area, Johnson said the MBTA is making some modifications, including adding caulking to joints and installing a glass panel to deflect the wind. He said the MBTA has not yet received the cost for the work from Consigli. A spokesman for Mayor Kimberly Driscoll said Tuesday her office had received one call on the platform work. Portions of the first floor of the parking garage were roped off and spaces unusable this month.